We were honored to attend the Akron Children’s Hospital Palliative Care 10th birthday party celebration in July. I talked to Randy about it before going because we knew a few staff members through friends, and we know some families who have been involved in palliative care services at the hospital. To be totally honest I was not sure what to expect for the evening. We invited some friends, who have been involved with Children’s Hospital from being foster parents in the past and they also have been an important aspect of Jordan’s life. We are so blessed to have family friends who are so loving and caring to our little peanut. After going to dinner, we found our way to the Akron Civic Theatre. It was our first time to the theater. We stood in awe of such a beautiful structure. 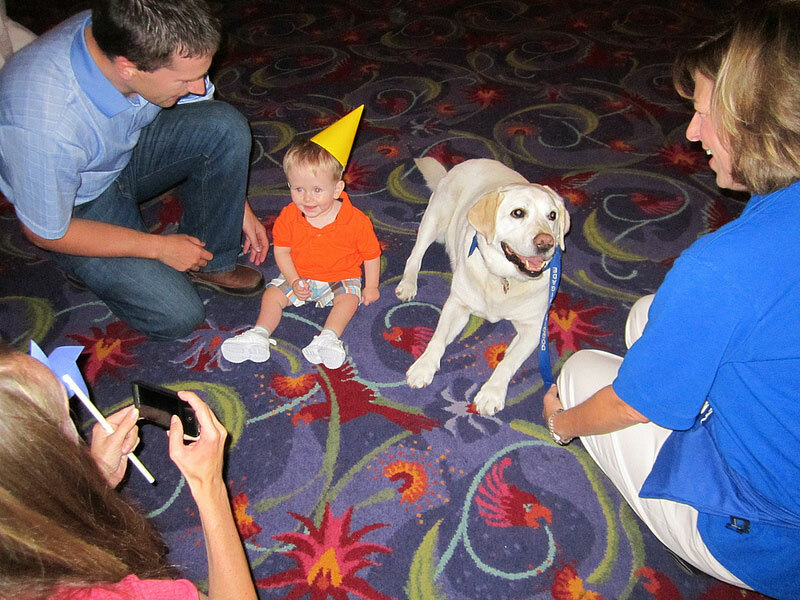 Akron Children’s Doggie Brigade was set up in the lobby so we let Jordan take pleasure in visiting with a sweet yellow lab. During my fieldwork while earning my occupational therapy degree, I prepared a presentation about pet therapy. I enjoyed watching a little boy who had a brain injury respond to playing fetch with a poodle. Jordan was just as excited to get down petting and interacting with his new friend. We then made our way to get Jordan’s face painted. It may not have been the best choice for a 1 year old, but he was wearing an orange shirt so we let him go with a basketball. His shirt was a little black on the sleeve, but it was a great first experience. The evening consisted of entertainment in a talent-show format. There were 10 acts that were voted on by donating money to the talent of your choice. The donations then went to assist families in the palliative care center with various financial difficulties. The first act came out in style with the president and CEO of Akron Children’s Hospital, Bill Considine and his wife lip syncing to Jonny Cash’s Ring of Fire. What a way to start an amazing night. There were skits, songs, and acts performed. For the finale, Dr. Friebert dressed as Tina Turner. It was a moment that I’ll treasure as we watched the crowd swell with pride as their doctor, their hero, stepped up and out of her shell to bring joy to their lives. You could feel the love they shared for each other. It was yet another area of Akron Children’s Hospital that brings a feeling of “your family matters to me” moment. We were also able to preview a documentary of seven families who have been, or are being treated, by the palliative care staff. As I watched these families and heard pieces of their stories, it made me understand there are so many families who have different levels of pain or difficulty, but we all want the same thing, our kids to have the best chance. That’s what I feel we get from Children’s. We have doctors and staff who care not just for the diagnosis, but they care for the child and their family as well. I pray that whatever happens with Jordan we will always be participants in sharing the love and appreciation by giving back to such a wonderful hospital.